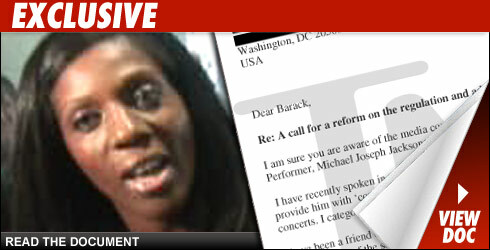 One of the doctors assisting the LAPD in Michael Jackson's death investigation has fired off a letter to President Barack Obama. The topic: To make it tougher for people to obtain "controlled medication." In the letter, Dr. Susan Essien Etok -- the doc who claims Michael offered her £500,000 to supply him with drugs -- urges the President to consider "harsher punitive measures" for "unethical Doctors" who are willing to hand out strong drugs to anyone with the right amount of money. Etok also says "no individual Doctor is responsible for Michael's death," then compares the singer's passing to that of Elvis Presley, Heath Ledger and Anna Nicole Smith -- all of whom died with drug cocktails in their system.